Today we have our first post from our awesome November Guest Designer! 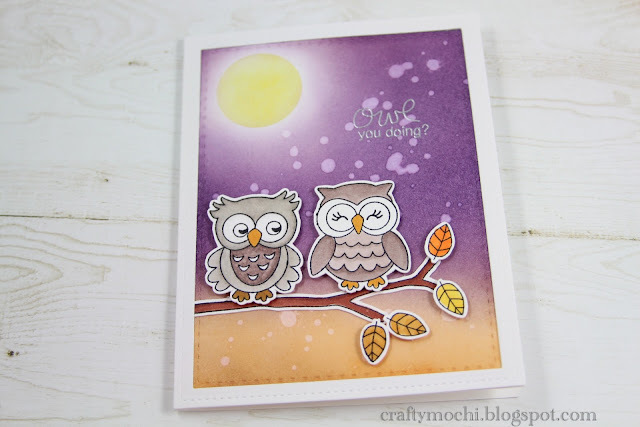 Gladys from Crafty Mochi will be joining us this month and wowing us with her adorable cards! Check out her first amazing project below and come back each Monday this month to see fresh inspiration from her! Hi everyone, it's Gladys here! I'm very excited to be the guest designer for Newton's Nook for the month of November. I'm married to my wonderful hubby Dennis, we have two amazing kids (boy and girl) who keep me on my toes and gives me the sweetest hugs and kisses. We also have a fur baby named Molly, she's our brave and mighty dog (all 12 lbs of her). My style of card making is cute and fun mostly scene building and also colorful. I like to play around with colors from happy bright to soft pastels. You can see some of my work on my blog: www.craftymochi.blogspot.com. I hope you will enjoy the cards I will be sharing. Thank you so much Jennifer for having me as your guest this month! Originally I was going to use this background for Halloween but I couldn't get it to work and I was actually going to throw it away. Fortunately I kept it and it turned out to be a great background for these sweet owls. For the moon I die cut a circle from sticky post it note then distressed it with squeezed lemonade. I then colored the background with seedless preserves, dusty concord, and wild honey distress inks. Next I stamped the images with Memento tuxedo black ink and colored them with copic markers. For dimension, I added foam tape on the back of the owls and leaves. Then I heat embossed the sentiment with silver embossing powder. I also added a white rectangle border frame because the card panel was smaller than my card base so this was an easy way to fix it. 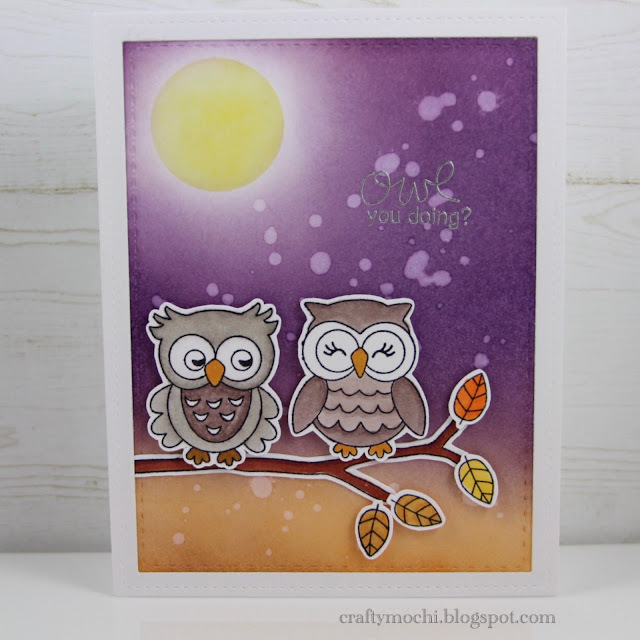 I hope you enjoy my first card using the What a Hoot stamp set. I will be back next week to share a holiday card, until then have a great Monday and a fabulous week! and owls are so cute! So fun and cute!!! What a lovely card! Adorable. I really like this stamp set. Think I'll buy it tomorrow.